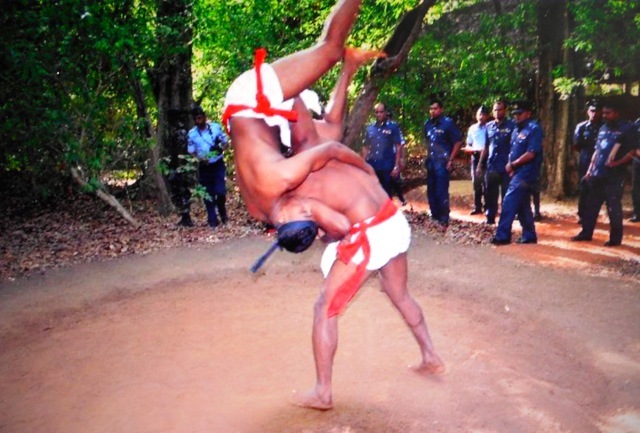 Sri Lanka’s rare martial art. An item in a local newspaper has set me on a discovery of a unique Sri Lankan martial art. The report reads: “A presentation and display on Angampora was conducted by the Sri Lankan Air Force Angampora team in Colombo last month, marking yet another significant milestone in history of the indigenous art of Angampora. Angampora, I discovered, is Unarmed Combat with Angam refering to the body while pora refers to combat. Angampora means the martial use of the limbs without the use of weapons, and is divided in to three main categories: (1) offensive and defensive techniques; (2) grips and locks; (3) vital point attacks. The origin of this martial art goes back thousands of years before the births of Buddha and Christ and together with its brother martial art, where arms are involved (known as Illangam), was banned by the British in the 19th century. This resulted in many masters (gurus) of the art, and its avid practitioners going underground. They devised various methods of concealing the art in plain sight. One was within the rhythmic movements of Sri Lankan traditional dance, where hidden within the graceful bend of a knee or the flip of a hand was the deadly and effective technique of Angam. This can still be seen in displays of traditional dancing today where the male dancers, clad in white loin cloths and the long, shoulder-length hair that are the trademarks of Angam practitioners, leap and tussle in breathtaking, choreographed elegance. In modern times as Sri Lanka opened up to the world, other styles of martial art seeped in like pop culture. The indigenous martial art became something of a legend, although a select band of practitioners persevered to preserve its purity in secret. A demonstration may seem like an artistic display of enthusiastic acrobatics but this martial art was devised as a way to kill one’s enemies without weapons. Angampora’s distinct feature lies in the use of pressure point attacks to inflict pain or permanently paralyse the opponent. Fighters usually make use of both striking and grappling techniques, and fight until the opponent is caught in a submission lock from which he cannot escape. The ‘Ange Medilla Ranapila’ mentioned in the news report is the training centre (actually a mud hut in a paddy field) in the village of Korathatotha near Kaduwela about 35km east of Colombo. There, Sri Lanka’s foremost master of Angam, Ajantha Mahantharachchi, practises daily with his group of devotees, including women. He began to learn the techniques from his grandfather when he was six years old, and subjected himself to the ritual and discipline of training (including a strict vegetarian diet) that makes him a perfectionist in the art. Another group practising and promoting Angam is the Sri Lanka Traditional Indigenous Martial Art Association (STIMA) which has its headquarters at Athurugiriya, some 30km southeast of Colombo. The Association has branches in Bandaragama, Boralesgamuwa, Kotte, Maharagama, Moratuwa, Polgahawela, Ratnapura and Thalawathugoda, as well as in Europe. STIMA began with the collaboration of gurus and students from various Angam clans who gathered to learn and to preserve the martial art by researching, categorising, organising and storing knowledge in one place for the benefit of future generations. STIMA is a government approved organisation that is also registered with the Ministry of Cultural Affairs. The head of the organisation is septuagenarian Grand Master R.Wickramasinghe, a descendant of the family line of Mudliar Wickramasinghe of Kotte. He is also an Indigenous Medical Practitioner. He inherited and studied indigenous medical techniques, treatment methods and traditional martial arts techniques, from both his father and grandfather so his knowledge dates from over 100 years ago. He has learned everything about this noble but deadly art. As well as passing on his knowledge to other gurus, he and his associate clans — as well as the clan of Guru Mahantharachchi who was involved in the Air Force performance — give public displays on request. If you ever get a chance to see Angam performed so meticulously, utilising only the skills and swift movement of the body as weapons, you will thrill to the lethal potential of the trained, moving body as well as be amazed at such artistic beauty in motion. Great Post! Definitely worth the read. Do you provide a service? or looking for a service provider in Sri Lanka, browse Connectme.lknow.